John Roberts, executive director of the International Grooving & Grinding Association, with Texas Department of Transportation (TxDOT)–Houston District employees Bill Brudnick (director of transportation planning and development), Mark Woolridge (director of maintenance), and Lucio Ortiz (director of construction). The Cement Council of Texas (CCT) in conjunction with nonprofit organization International Grooving and Grinding Association (IGGA) named the employees of the Texas Department of Transportation (TxDOT)–Houston District the recipients of this year’s Government Official of the Year Award, honoring individuals and organizations for contributions made to the grooving, grinding, and concrete pavement restoration industry. 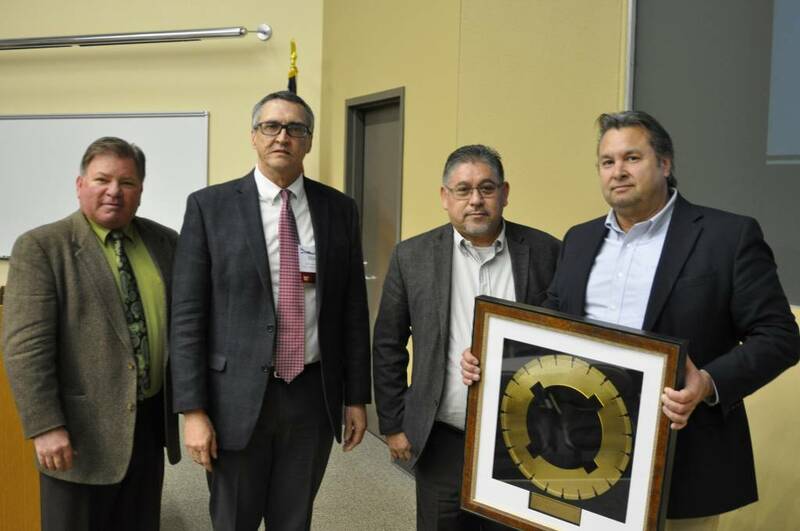 The winners of the national award were praised for their efforts in advancing the understanding and use of quiet concrete pavement surface textures utilizing the Next Generation Concrete Surface (NGCS) in Texas. The city of Houston has incorporated approximately 2.5 million m2 (26.9 million sf) of the noise-reducing material into several major highway systems, says IGGA.